How many children do you have? I have 6 married adult children. How many grandchildren? What are their ages? I have 23 grand children. They range in ages from 27 to 20 months. One married and living in London and the mother of the 2 great grandchildren, 6 in college, 3 in high school, 4 in junior high, 5 in grade school, 2 in pre-school, 1 just hanging out with mom, and one lives with Heavenly Father. Any great grandchildren? 2 they live in London, but are coming to the states for a long visit next month. What do your grandchildren call you? Mostly Grandma, but some families call me “Grandma Diane” to keep me straight from the other Grandmas. What was your first concern about being a grandma? It was so long ago I can’t remember there was any. My husband did have a bit of a problem being married to a “Grandma”. He wasn’t ready yet. How often do you get to see grandchildren? A few families live within a two-hour drive and I see them at least every couple of weeks. Those that live farther away, Nevada and Utah, I try to see a few times a year. My husband passed away 18 months ago and since then I have been on the road more going to visit. I want them to know who I am. What is the best thing about being a grandma? Being able to go home and leave the problems with their parents. What is the most challenging part of being a grandma? Keeping my mouth shut, but I do it. Describe a recent time that one of your grandchildren made you laugh out loud. I was baby sitting Jack, who was learning to “potty train”. His mother had told me not to let him backslide so I’d been on his case all day with reminders and encouragement. As I was putting on his pajamas I put on pull ups and he said, “Pull-up, Oh good” with a big sigh of relief that the pressure was off for a few hours. I laughed out loud. What is your favorite thing to do when they visit you? Hang out and catch up on the lives of the older ones. Getting out the toys and games with the younger ones. What is your favorite thing to do at their house? Swimming with them is great fun. Playing board games and losing even when I am trying to win. How do you maintain the bond between visits? The phone and Internet are the best ways. What do you want to pass along to your grandchildren? How important family is. How much we love each other and are there for each other. 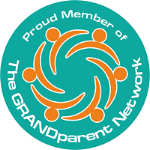 What is the one thing you wish you had learned earlier as a grandparent? Relax and enjoy the journey. What bit of advice would you give a new grandma? Make every effort to see and be with your grandchildren. They won’t know you if you don’t spend time with them. It takes effort to do, but it is worth it. Do you have a blog? I have a blog, Wonderful Wearables. I use it mainly to keep in touch with my students. I teach all kinds of fabric and textile arts from painting and dyeing fabrics for wearable art to art quilting. Dear Readers: If you'd like to nominate a grandma for grilling—yourself or any other grandma—please e-mail me her first name and e-mail address and I'll take care of the rest. Thank you!